Pfizer’s Xalkori (ingredient: crizotinib) has been solidifying its status as the only first-line treatment for anaplastic lymphoma kinase (ALK)-positive advanced non-small cell lung cancer (NSCLC). However, the anticancer drug is suffering sales declines because of the next-generation rival drugs’ growth, industry data showed. Xalkori’s global revenue started to fall particularly since last year when Novartis’ Zykadia (ingredient: ceritinib) and Roche’s Alecensa (ingredient: alectinib hydrochloride) expanded indications to become the first-line treatment for ALK-positive NSCLC. Physicians began to use Alecensa as the first-line therapy last year in earnest. According to Pfizer’s quarterly global earnings reports of 2018, Xalkori sales continued to decline from $153 million in the first quarter to $137 million in the second, and $127 million in the third. The sales in the third quarter were a 13 percent drop, compared to a year earlier. In contrast, Roche’s Alecensa sold about $440 million in the first nine months last year, surpassing the sales of Xalkori at $417 million in the same period. The National Comprehensive Cancer Network, an alliance of 28 cancer centers in the U.S., began recommending Alecensa as the first-line treatment for ALK-positive NSCLC last year. Some observers raised concerns that new ALK inhibitors lacked follow-up treatment options if they fail as the first-line therapy. However, others said the trend of Xalkori being replaced by Alecensa was irreversible. Skeptics, who do not expect a rapid generation change in the first-line treatment, take an example of hepatocellular carcinoma treatment. Proponents of the Alecensa use, however, say Xalkori’s case is entirely different. Bayer’s oncology product Nexavar (ingredient: sorafenib) was the unique standard treatment for last-stage hepatocellular carcinoma for over a year. However, new treatment options including targeted therapies and immunotherapies started to emerge in the past one or two years. Among them, Eisai’s Lenvima (ingredient: lenvatinib) joined the list of the first-line treatment options. However, Lenvima failed to prove a remarkable improvement in effectiveness compared to Nexavar because it only showed its non-inferiority to Nexavar. Plus, Lenvima lacked evidence for follow-up treatment options in case of treatment failure. On the contrary, Alecensa has already proved its superiority to Xalkori, which will leave no room for reconsideration when urgently treating a last-stage lung cancer patient, Alecensa supporters said. 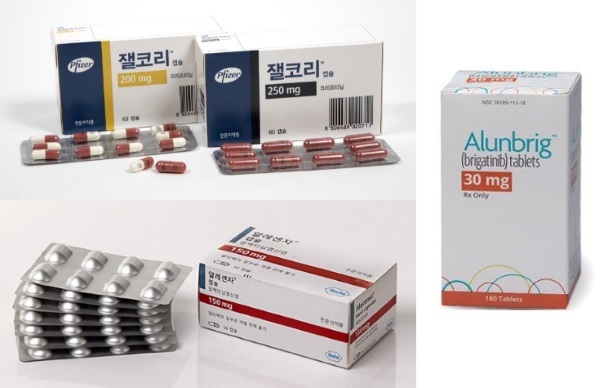 Moreover, experts expect faster sliding of Xalkori’s sales in the future, predicting that Takeda’s Alunbrig (ingredient: brigatinib) could have a powerful efficacy as the first-line treatment for ALK-positive NSCLC. The U.S. and Europe already approved Alunbrig to be used as a second-line treatment in case of Xalkori’s treatment failure. Takeda is hoping to expand Alunbrig’s indication to be used as the first-line treatment in the U.S. within this year. Takeda is testing Alunbrig in phase-3 clinical trial ALTA-1L in comparison with Xalkori, for patients with locally advanced or metastatic ALK-positive NSCLC who have not been treated with ALK inhibitors. The remaining task for researchers in the ALK-positive NSCLC treatment is to develop follow-up therapies. Pfizer is working on Lorbrena (ingredient: lorlatinib) as a successor to Xalkori. Pfizer obtained approval of the U.S. Food and Drug Administration for Lorbrena in November, for treating patients with ALK-positive metastatic NSCLC who have been treated with one or more ALK inhibitors, including Xalkori.